Setting a Nationwide standard in digital image capture for identification and verification. 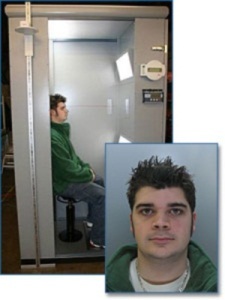 The Digital Image Booth is a compact, self-contained unit with a footprint of only 138cm x 72cm (54” x 28”). To minimise any possible damage, the tough metal shell has a smooth surface with all key equipment held within sealed units. Image capture and quality checks are operated remotely, either at a workstation outside the booth or in an adjacent area. In the Digital Image Booth user error is virtually eliminated, allowing you to capture consistently high-quality digital images (facial, scar, mark and tattoo). displays parameter values for facial quality attributes including illumination, pose, occlusion (for glasses deflection / specular reflection) focus, pose and overall compliance. 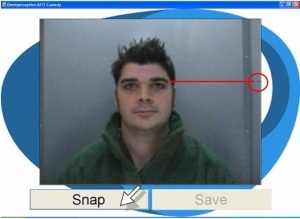 Automatically detects eye centres as well as auto-rotating and auto-cropping the source image to create the required Token Image (eg ISO, FIND or other standard). Provides single or batch processing for generation of Token Images to a target directory. Fitted USB2 socket allows hook-up to existing computer systems. Booth will fit through any standard-size doorway (length 138cm/54” x width 72cm/28” x height 208cm/82”). Robust steel construction with smooth interior to minimise accidental / wilful damage. Internal floor is easy-clean, non-slip PVC. Open doorway to booth avoids any concerns about claustrophobia. Easy access to capture equipment via hinged panel in door. 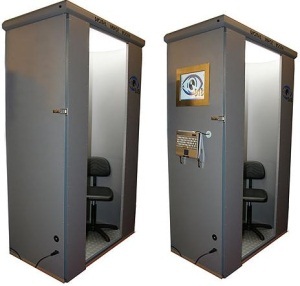 Supply of each Digital Identification Booth includes full installation, set-up, training and 12 month on-site warranty. Expendable items such as lamps and fuses are not warranted.